Mike is the current 24 hour solo MTB World and National Champion in the 45-49 age category. 'Mighty Mike' has some impressive results as a solo and team rider and is an all-round top guy. Rides for the Quantum Racing team. Jason won the World 24 hour Solo (40-44) in 2013 and the 35-39 age category in 2010, the Marathon National Championship Title in 2012 and was first in the Veteren's XCM Marathon Series Championship in 2012. Rides for the On-The-Go Racing Team. Benjy has a proven track record in several 24 hour and 100 km races. He was 2nd to Jason McAvoy in the 2013 edition of the World solo 24 hour at Mt. Stromlo, Canberra. Trent is another rider who hails from Canberra. He is quick and is always in the mix at the end of races. Dave is a close rival in any MTB event we find ourselves racing together. Ian finished a heart-breaking second to Mike Israel in the 45-49 category at WEMBO in 2013, after being overtaken on the last lap of a 24 race. Ian has gone from strength to strength in the last year and is now a major rival in 7 hour enduro events. Stu is an exceptionally strong rider who is a regular winner of Masters events. Ben is a quick rider, usually found racing in the team's categories. Recently teamed up with Mark Hardy to win the Masters Pairs category of the STM series. Mark is another fast rider, who won the masters pairs category of the STM series alongside Manly club mate Ben Edols. Jamie hails from the Port Macquarie area and has trained extensively with World Champion, Jason English. Andrew is an extremely strong rider, who is continues to improve. Alex is a major competitor in the Masters age category and rides for the Quantum Racing Team. He is currently competing in the 2014 edition of the Crocodile Trophy. Whenever Hugh races, he gets quality results, and is common for him to grace the podium. Stephen Billington is another Quantum Racing rider who is extremely competitive in the Masters Category. Guy always performs consistently and is steadily improving. Peter is a Super Master who loves to mix it up with his younger Masters competitors. An extremely fast starter with a track and road background, admirable support from wife Nancy and the recent Vintage winner of the 2013 Ingkerreke Commercial MTB Enduro and the Super Master winner of the Jetblack 24 hour in December 2012. 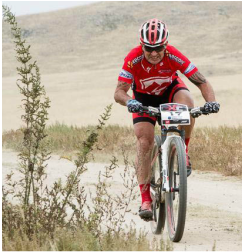 Recently, he teamed up with Garry James for the Trans Alps and came 5th in category, they came 2nd in the Sudety, Poland and they finished 4th together in the Cape Epic in South Africa in 2015. Garry won the World 24 hour solo (50-54) in 2013 and has won his age category at the National 24 hour championships for the past five years. When age categories allow, Garry races in the Super Masters but competing in the Masters rarely stops him winning. Rides for Specialised Racing. In 2012, Garry was a finalist for Cycling Australia Masters Mountain Biker of year.